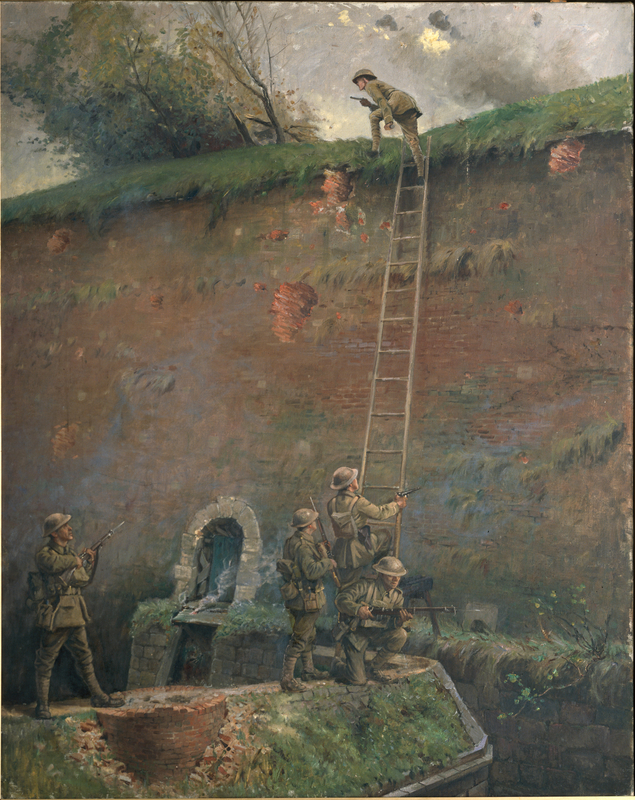 A number of myths have been circulating about the final and successful assault on the inner defensive wall at Le Quesnoy during the town's liberation on the fourth of November 1918. This is an attempt to set the record straight based on a number of contemporary sources. The orders for the attack by the New Zealand Division on the 4th of November explicitly state that Le Quesnoy was not to be attacked but encircled under the cover of smoke. It was after achieving their objectives that the 3rd New Zealand (Rifle) Brigade set about "mopping up" the town. The german garrison failed to cooperate by surrendering even after repeated attempts to get their surrender including a request dropped by an aircraft. Different battalions then started to force approaches from different directions through the outer fortifications of the town. There were several ladders and floats at this stage to deal with the flooded moats and outer walls. The stained glass window in St Andrews Church with its multiple ladders may be more accurate than many give credit. Lt Averill leads the assault on the inner wall at Le Quesnoy. The successful scaling of the inner wall was planned and executed by the 4th Battalion of the Third New Zealand (Rifle) Brigade. It required the clearing of two bastions, one each side of the wall to be scaled by bombarding them with motar fire, rifle grenades and raking them with machine guns. The wall ramparts were also similarly cleared. By this stage there was only one serviceable ladder. This and a number of men had to be placed at the base of the wall without arising too much suspicion. Having got the men in position two riflemen placed the ladder's footings on a narrow ledge/sluice gate structure and raised it. Before the top of the ladder touched the wall 2nd Lt Leslie Averill is reported as being half way up it. Averill on dismounting the ladder did encounter opposition. Close behind him was 2nd Lt H W Kerr and other men from the battalion. Next on the ladder was the officer in charge of the 4th Battalion, Major Barrowclough, and two signallers with their equipment. At 4:15pm it was reported that they were in the town and about fifteen minutes later men from another battalion stormed through the Valenciennes Gate. The German commander that evening surrendered to an officer from the 4th Battalion. The New Zealand (Rifle) Brigade by 1916 was made up of four battalions. Unlike other brigades in the NZ Division, the battalions were not provincial battalions and so were simply numbered 1st, 2nd, 3rd and 4th. The 1st NZ Infantry Brigade by contrast consisted of the 1st Auckland, 1st Canterbury, 1st Otago and the 1st Wellington battalions. There is nothing in the records to support the supposition that Cambridge men led the liberation of Le Quesnoy. Averill was a Cantabrian, Kerr appears to have been from Woodville, Barrowclough was from Palmerston North and Herbert Hart the officer in charge of the New Zealand (Rifle) Brigade was from the Wairarapa. There was at least one soldier from Cambridge who participated in the action that day. He was Clive Mortimer Jones who enlisted while vicar of St Andrews Anglican Church and returned to be its vicar on his discharge. The name missing from this account is another Cantabrian Lawrence Maurice Blyth. 'Curly' by this time was a young 2nd lieutenant commanding C company in the 1st Battalion of the Rifle Brigade and so took part in the battle but was not part of the party that scaled the inner wall. "Local legends have already grown round the circumstances of the capture of Le Quesnoy. In Sept. 1919 an elderly quidnune pointed out with assurance the tree which Averill's party had cut down against the rampart to effect ascent." The New Zealand Division's last significant battle of the First World War was very well planned and executed resulting in minimal casualties and damage to the old fortified town of Le Quesnoy. There were no civilian casualties in the town. All the objectives were achieved. This must rate as one of the most successful actions in New Zealand military history. "The Official History of the New Zealand Rifle Brigade". Lieut.-Col. S. Austin. Published by L. T. Watkins Ltd., 1924, Wellington. "Official History of New Zealand's Effort in The Great War. Volume 2 France. The New Zealand Division 1916 -1919. A Popular History Based on Official Records". Colonel H Stewart CMG DSO MC. Published by Whitcombe and Tombs, 1921.